My very first food blogging post. Ever. Originally posted February 24, 2008. Just about two years later, I am reposting it to officially start Not Just Take Out. My thoughts on the food I make, the food I want to make, the drinks I love, the restaurants I adore, and the gadgets I fill my little kitchen with. Enjoy! too out of the ordinary, dinner the other night was quite the success. And I had some fun taking pictures while I prepped it since everything was nice and colorful. 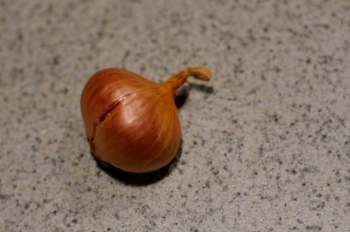 You can never go wrong starting with a shallot. Rather than use one bell pepper for a recipe for the two of us, I like to use half a red, half a green. Then, I end up with two colorful tasty meals!